We are Indonesian driver’s licence translation specialists in Australia. Our NAATI accredited Indonesian licence translators have been translating Indonesian licences into English for use in Australia for many many years. Our Indonesian licence translation is 100% acceptable for use in Australia to drive a car on a holiday or rent a car from a car rental company. 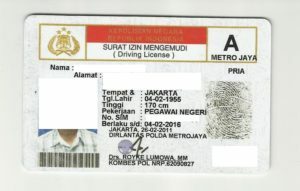 Why should I translate my Indonesian driver’s licence into English? We can translate your Indonesian driver’s licence into English online today from only $69.00 per licence. To order your Indonesian to English licence translation today, click here. Do you have an Urgent Indonesian licence translation option? Wow – what a fast service! I received the translation of my licence within 6 hours and was renting a car the same day. Me and Julia were both very happy with the Indonesian licence translation that your Indonesian translator completed for us. Please pass on my thanks! Urgent Indonesian Translation? We can help! Our Indonesian driver’s licence translation service pricing starts at just $69.